Aguilar died late Tuesday after a long fight with pneumonia, Medica Sur hospital spokeswoman Shere Sanchez said. Born in the northern state of Zacatecas, Aguilar recorded with his traditional mariachi group for 50 years and sold more than 25 million records. 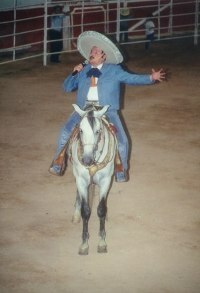 His hit songs include "Triste Recuerdo," "Albur de Amor," "Gabino Barrera" and "Puno de Tierra." Aguilar's son, singer Pepe Aguilar, is also one of Mexico's best-known performers and has been nominated for a Latin Grammy six times. The elder Aguilar was the first Mexican artist to mix concerts with rodeos in shows that featured his actress-singer wife, Flor Silvestre, his two children and dancing horses. In the 1970s, he took his show to major cities in the United States and Latin America. "Antonio was the one to open doors for us in the United States and in Latin America with his great show," said ranchera singer Vicente Fernandez. He began his movie career as an extra and eventually appeared in 167 films, acting alongside such greats as Pedro Infante and Jorge Negrete. He also appeared in American Westerns, including "The Undefeated," starring John Wayne. In 2000, he got his star in the Hollywood Walk of Fame. "I love to be in the USA," he told hundreds of fans who gathered for the occasion. "This is one of the most important episodes of my life. I never expected this."